Recently, Stephen Smith wrote a great piece for us on how your church can get the most out of Facebook and its news feed. But we didn’t have any data on how churches are currently using Facebook in real-world scenarios. So we turned to you, faithful readers, to see what your current strategy is for making an impact with Facebook. Much to our chagrin, the winner is: We have no strategy. 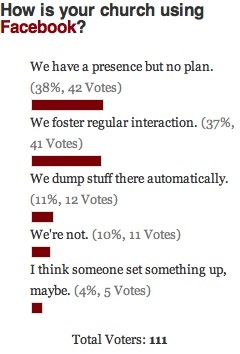 That’d be the 38% of you who have a presence, but not a plan. We’d encourage you to research a bit more, but even a bad plan is better than no plan. Set up some guidelines, these could be as simple as: “Engage often. Respond wherever possible, and let no interaction go unanswered,” or “Favor the news feed. Ask 10 questions a week, and create a Facebook event once a month.” It doesn’t have to be fancy, but it should exist. Maybe you can take a cue from the near-winners: the 37% of respondents that are fostering regular interaction. Congratulations, intrepid Facebook trail blazers. Now help your fellow churches out and tell us what you’re doing in the comments. And lastly, 14% of you aren’t engaging at all. You’re either not using Facebook, or you think someone might have set it up awhile back, but certainly no one maintains your presence. In the comments, let us know why you’re not engaging. Too much on your plate? Don’t think your congregation maintains an active presence? Something different? This week, we’re talking about social media again, in light of our interview with The Table team-member Jason Wenell. So what do you think, does the church need its own social networking site? Vote on our home page now! I wasn’t given a link but a friend copied the following article to me (ed. note: Here’s the link: http://www.worshipfacilities.com/go.php/editorial/12008 ). Having trouble using RSS feed from church, but making some changes to our facebook page @ http://www.facebook.com/MountZionUMC — not all of which you can see. Still struggling to get more interaction on the page. Some of our choices may be more hopeful than it would appear. Though imperfect, I chose “We dump stuff there” because a) we don’t really have a plan (because I am the only one doing it – so far) and b) I can’t really say there is “interaction” (yet). I “dump stuff,” I post reminders about upcoming events, make announcements, post prayer requests, links to interesting articles and yes, even ask questions. So far, however, the communication is largely one-way. I get few, if any, replies. I do notice that more people are reading and watching especially as we’ve begun posting photos taken at the youth group events, etc.